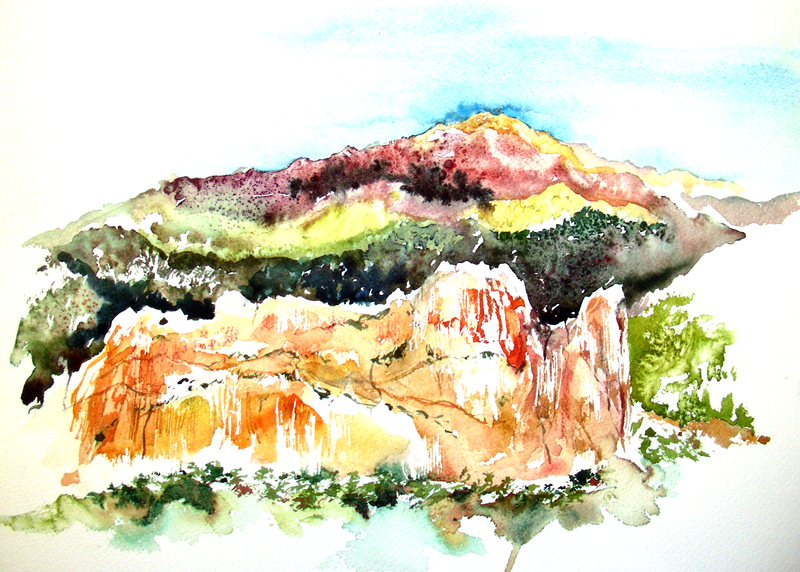 One last watercolor sketch–this was my second plein air work done at the Garden of the Gods on the first morning, following my initial Pike’s Peak sketch attempt. Yesterday, while wrapping up my vacation in Lubbock, Texas, I re-worked the foreground foliage on this to try and set it off better. On my final morning in Colorado Springs, I re-joined Carolye Asfahl at Garden of the Gods and went to work on this vista in the rising sun before my departure to Denver. Kissing Camels is called such because of the extreme left of this rock formation, where kneeling camels in profile appear to be touching muzzles. The morning was fresh and beautiful and the light was terrific, as usual in the Colorado climate. I hated to leave Garden of the Gods. I finished up this composition by re-touching the sky and some of the background trees, while finishing up my vacation yesterday, in Lubbock, Texas. This watercolor sketch will always hold special meaning for me. 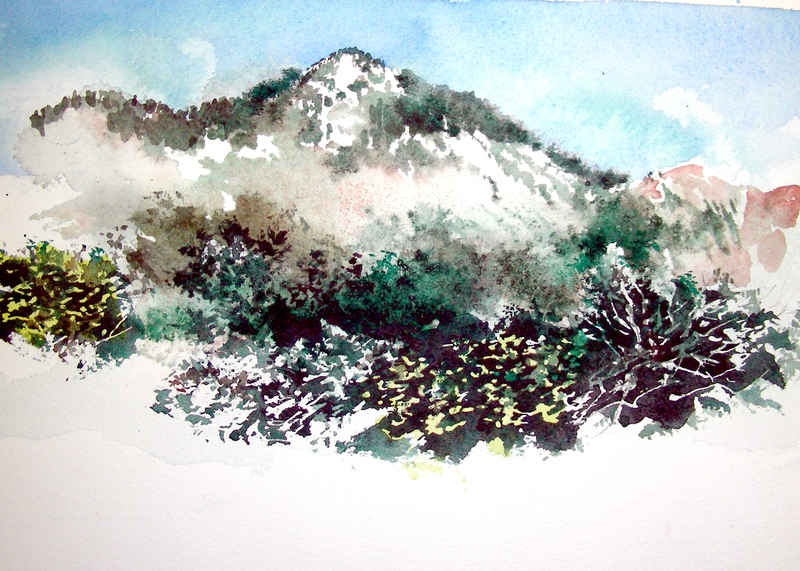 It was my primary intention while vacationing in Colorado this year to do plein air watercolor, and to focus on mountains. It just happens that my first attempt was of Pike’s Peak viewed from Garden of the Gods. I had the privilege of painting alongside Carolye Asfahl of Colorado Springs, my student from my first year of teaching at Lamar High School, Arlington, Texas. 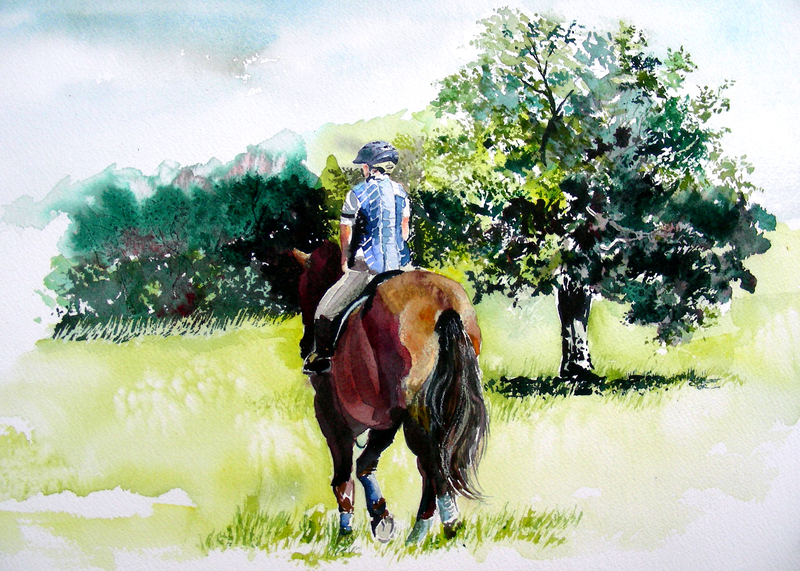 Carolye is a very gifted artist who has recently committed to doing watercolors en plein air. It is my genuine hope that she will start a blog soon and post her fabulous works. This sketch was begun on location, and then tweaked yesterday while I finished my vacation in Lubbock, Texas. This watercolor was begun on site several weeks back. It is part of what remains of the old Cooksy Station on historic Route 66 southwest of St. Louis. This billboard adjoins the property of an abandoned Zephyr gas station on Route AT at Villa Ridge, near Interstate 44. I found it with considerable difficulty (a state trooper pulled me over for an illegal turn in St. Clair, and I explained what I was seeking–he gave me a warning, and directions!). I took several pictures of this billboard, and then painted the remains of the gas station as the early evening light was fading. Later, I arose at sunrise (staying with my parents in High Ridge, 40 minutes away) and drove to this site and painted it in the morning light, until a heavy thunderstorm darkened the skies and chased me off the site. Thanks to photographs, I was able to return to the composition on numerous occasions. Yesterday, in Lubbock, Texas, I was finishing up a number of watercolors begun during my St. Louis travels of a few weeks ago, and a more recent Colorado vacation. 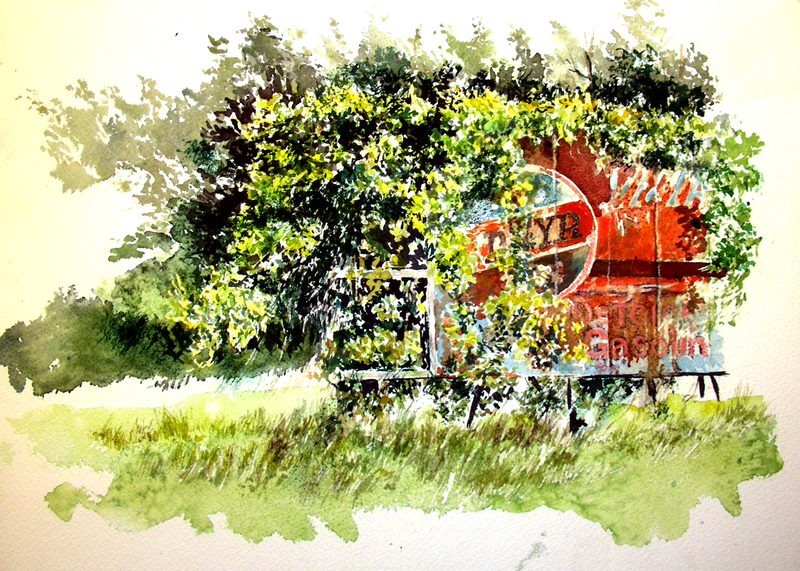 With this particular composition, I needed to deepen the dark shadows above, behind, and within the foliage covering the billboard. The weedy bottom portions also needed some additional tweaking. I’ve decided now that it is finished. Finally finished my Creede, Colorado watercolor, while enjoying an idyllic (hot!) afternoon in Lubbock, Texas. 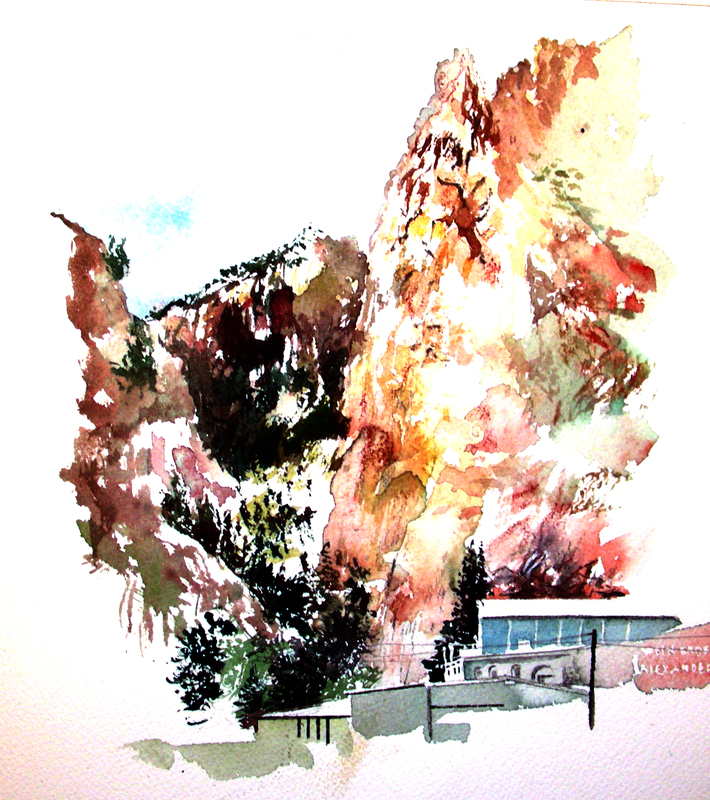 I could not complete this watercolor on location, because it continued to rain off and on throughout the day in Creede. Sandi and I holed up in The Old Firehouse coffee shop, enjoying Internet surfing, cups of coffee, and plenty of journaling catch-up. I only got to work on this watercolor about 30 minutes before the rain chased me away. Hopefully, I’ll have another opportunity for plein air Creede in the future. After more than 3,000 miles of driving over twelve days, Sandi and I finally returned home late this evening. 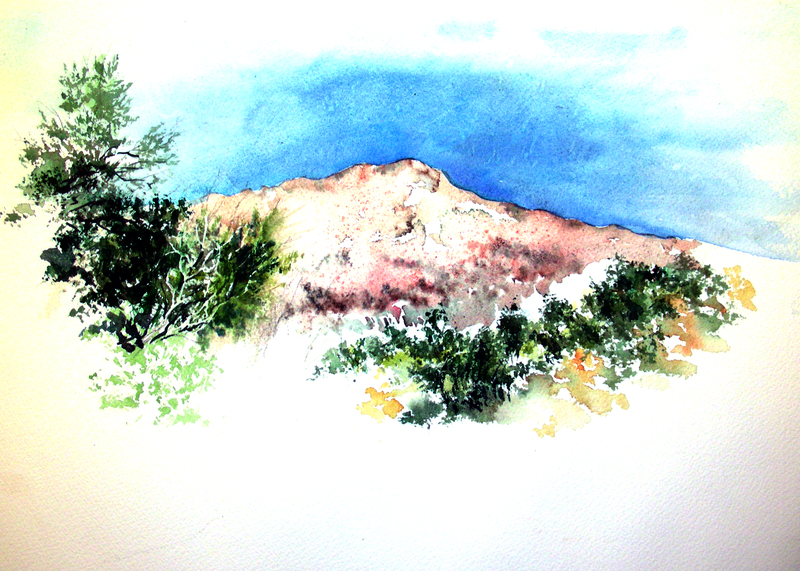 I have plenty of watercolors to post–I managed to do seven of them during the trip. Some have already appeared in their working stages, but today in Lubbock I put finishing touches to a number of them and thus will post them again. 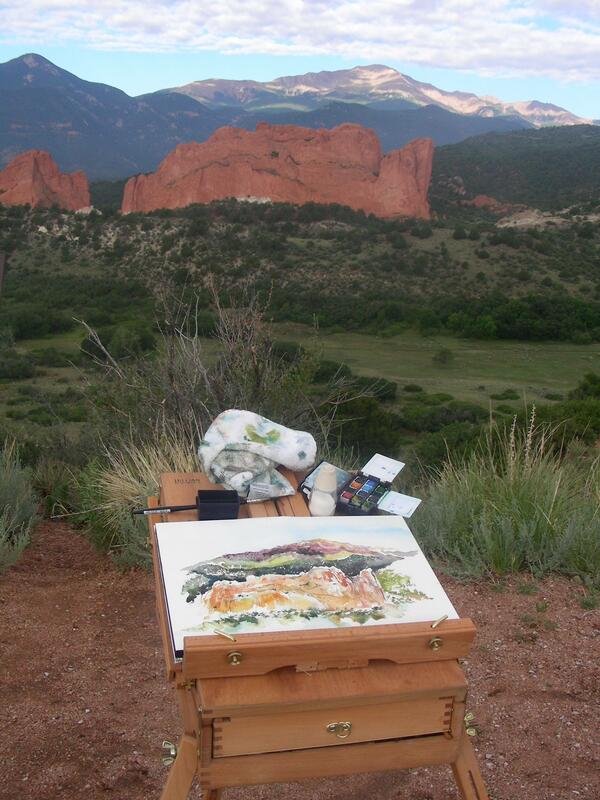 My agenda in Colorado was to paint for the first time there en plein air. And my primary subject was going to be mountains. I had hoped to paint stands of Aspen trees as well, but didn’t get that done. If you’ve been following my blog, you already know that I did some sketches of Pike’s Peak, Crested Butte and the bluffs behind the town of Creede. What is posted above is the result of a silly inclination that seized me on the final day that we left Colorado, with Sandi driving. Sitting in the passenger seat, I was intoxicated at the endless passing of mountain ranges, so I giggled and pulled out my leather bag of watercolor supplies, opened a bottle of water, drew out a block, and began doing sketches of the mountain ranges as they passed us by. I held the block in my lap and just continued to add mountain ranges, one ribbon at a time. This is what finally emerged. I cannot tell you where this location is, because it is the combination of ranges and meadows that I witnessed over a 3 1/2 hour drive from Almont to Salida to Canon City to Walzenburg to Trinidad to Raton Pass. And I enjoyed every minute of the experimentation. Glad to finish this one, finally. Sandi will be surprised. She knew I started this several weeks ago. 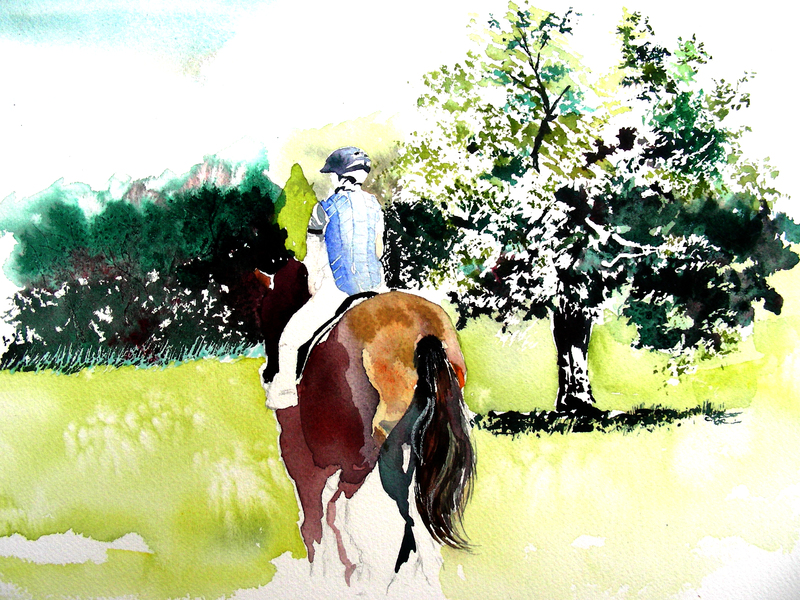 But she only saw the outlined pencil drawing of her riding Andante. Today while she was out doing “horse” things with her daughter, I worked as quickly as possible to finish this up. It’s always hard to know when to quit and just let the painting go. I think I have done all I can to it. Maybe I’ll change my mind in the days ahead, but for now, it looks “finished” and I’m going to leave it at that (for the time being!). How remarkably blessed I’ve felt during our vacation which will have run about twelve days, once it ends tomorrow night. We left Colorado yesterday, and arrived in Lubbock, Texas last night. Sandi’s daughter has just purchased property west of town and is developing an equestrian facility. Sandi joined her early this morning, allowing me to sleep in for the first time on this entire vacation (always fly fishing, plein air activity or itineraries to get one of both of us up early each day!). After sleeping in, and enjoying the exercise facility at this Holiday Inn, I have now relocated at poolside, where the enormous sky-lighting gives me great quality of plein air light for re-working some watercolors in progress. A few days before leaving on vacation, I accompanied Sandi to Greenwood Farm, an equestrian facility west of Weatherford, Texas. It was a blazing hot Texas day, and I chose to stay in the shade for the most part, while Sandi sweated out the activity of riding Andante in a clinic involving jumping. Before they left to do their thing, I photographed them several times. Then using the laptop to view an enlarged photograph, I drew Sandi and Andante as carefully as I could. I did not like the backdrop in the photograph, so I went out onto the property and found what I thought would make a more suitable backdrop for inserting the equestrian subject. I finished most of the foliage en plein air and then left the rest of the composition unfinished while we vacationed in Colorado. Now, at a Holiday Inn poolside in Lubbock, I have taken this painting back out and spent considerable time this early afternoon rendering Sandi and Andante in color, tweaking the backdrop of foliage and adding some foreground color. I’m really enjoying watching this take shape. Maybe I’ll get it finished before the day is done. Sandi just phoned and they will be picking me up for dinner at 7:00–about four-and-a-half hours from now. What a splendid day, getting to work outside my hotel room in natural light, yet still inside the building (thus avoiding one of those disgusting 105-degree days–ugh!). It’s getting late (and cold) in Almont, Colorado. Like Eddie Albert on Green Acres climbing the utility pole to use the phone, I have to leave my cabin, cross the street and sit on the front porch of the general store of Three Rivers Outfitters to access their wireless Internet. 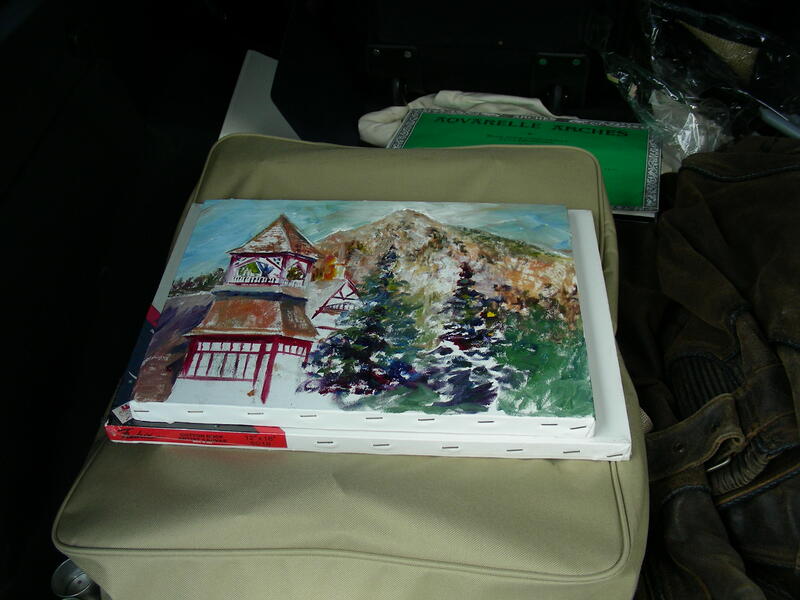 I didn’t have the courage to post a close-up of this painting, so I photographed it lying in the back of my Jeep. Finally I worked up the courage to attempt a plein air oil painting. Sandi and I were in Crested Butte all day, and it rained off and on throughout the afternoon. Finally, I set up my French easel and went to work on the same church cupola that I watercolored en plein air from a different angle the other day. It constantly drizzled on me as I toiled over this, but I’m not using that as an excuse. I found myself in unfamiliar territory as I worked oil on canvas, and very little of it I found pleasant. I guess I expected too much of myself on the first attempt. It will certainly not be my last. I’m glad I gave it a shot. And I’m glad I was in Colorado when I did it. I really wanted to try this in Kremmling several days ago, but the days were dark and overcast. I also brought my equipment to Creede, but the constant thunderstorms also led me to decide against it. Were this not my last day in Colorado, I would have allowed the weather to postpone my attempt as well. I’m glad I saw it through. Once I return home, I plan to set up the easel in the backyard and work further on this piece. We leave tomorrow morning, early, for Lubbock, Texas and triple-digit temperatures. I may find some plein air opportunity if I can find decent shade. Not sure what I’ll find there.